Having a stylish home doesn’t have to be expensive. If your interior design requires an end table for most of your rooms, it can get expensive. End tables can cost up to three hundred dollars. Not a practical price for something that you would buy in bulk. 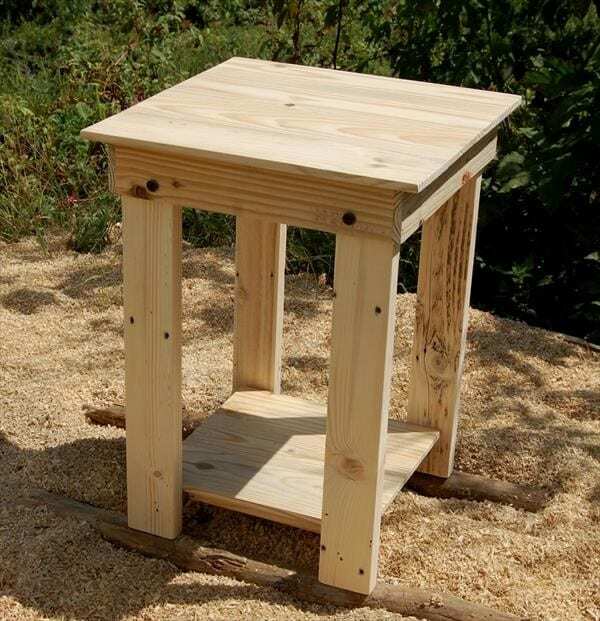 Fortunately, if you’re into DIY or if you have a bit of experience in woodworking then you can opt to build your own end table. It doesn’t require much and costs cheaper than a second-hand furniture. Of course, woodworking can get a little stressful when you don’t know where and how to start, that’s why I would like to share a list of projects you can start on right now. Here are 12 DIY End Table Plans you can try just using a wooden pallet. This DIY plan is so easy to do you can finish it in less than 2 hours. As guaranteed by the blogger. Doing this by yourself would be a lot easier if you have a few more than basic carpentry or woodworking tools. Have a crowbar ready to dismantle your wooden pallet then use a slightly higher grade saw like a circular wooden saw. That’s a lot easier and would take less time than using a hand saw. Also, if you have a basic sander, that would come in handy by the time you finish upcycling your wooden pallet into this end table. Just make sure to check the site for a complete dimension and measurement of this plan! 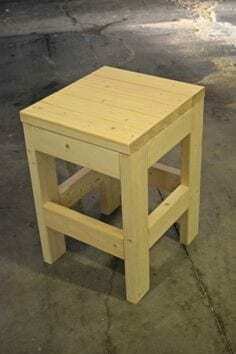 This Instructables plan only has ten steps and can be easily done with a standard 48x40 North American Pallet. The process for this DIY project starts off like most DIY wooden pallet projects, dismantling the wooden pallet. So, make sure to check if you have a crowbar in your toolbox. 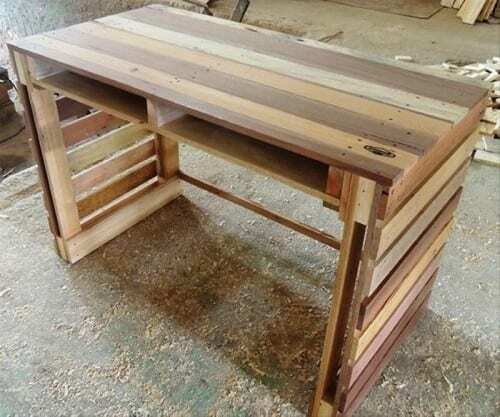 As a DIYer, I can say that this is a fun and easy project that would need a little more than your average woodworking skills and just about seven to eight hours. This YouTube DIY Pallet End Table is only three minutes long but delivers a lot of detail on how to build your own pallet end table. Using a standard North American shipping pallet may cause more work for you though, so I suggest that you use a two-way entry close boarded pallet to do this. If you’re wondering what that is, that is a type of wooden pallet. The good thing about YouTube Videos is that you get to see how they do it exactly, albeit in fast forward. 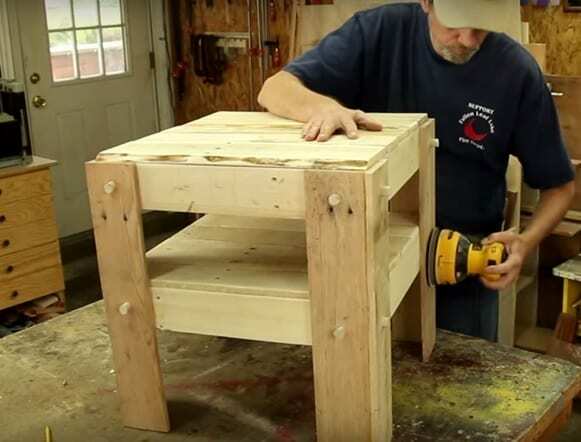 This six-minute video shows you the process of building your DIY Pallet End Table. In this video, he uses tools like a circular saw, a grinder (he added bolts and nuts) and a higher-end wood planer. But you wouldn’t have to buy all these costly tools if you don’t have them. You can simply swap the circular saw for any basic wood saw, the wood planer with a cheap basic wood sander and/or planer. As for the grinder, you can opt to hammer all your wood and not use bolts and nuts, or you can use a drill to bore holes and buy just the right length of bolts. Of course, you can make it look as if it’s brand new by using wood finishing products and/or wood paint. 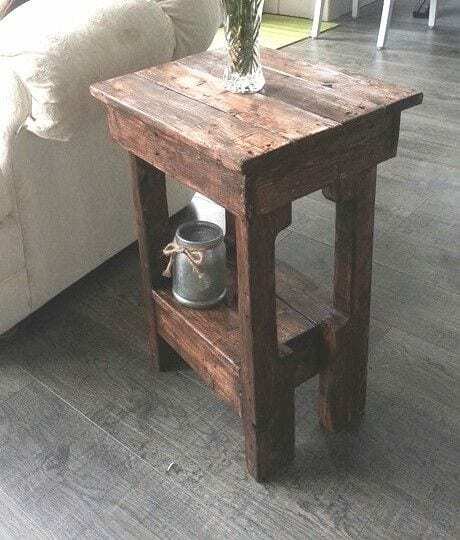 This DIY Rustic Side Table Made from free pallets may require an actual workshop. 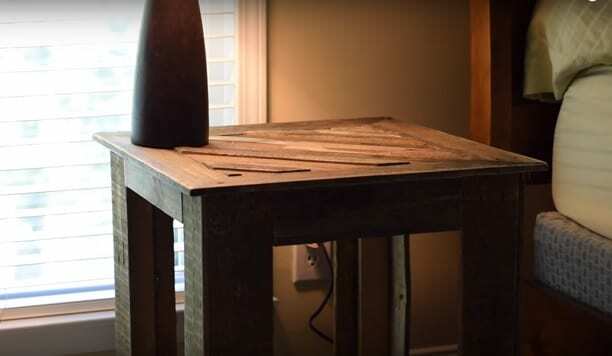 The video shows how easy it is to make this rustic end table with intermediate DIY and carpentry tools. Of course, switching tools is an option but will cost you more time and energy. But as a fellow DIYer, I can’t say there’s something as too hard to DIY! 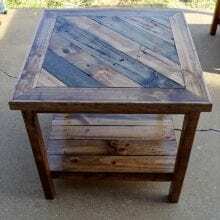 This DIY Pallet Wood End Table looks very sophisticated and you would mistake it for something that you would buy at those expensive furniture stores. But this nine-minute DIY video shows just how easy it is to DIY even this expensive looking furniture. You may want to use two-way entry close boarded pallets for this one, so you wouldn’t have to cut the width of the planks. Make sure to check this DIY plan! 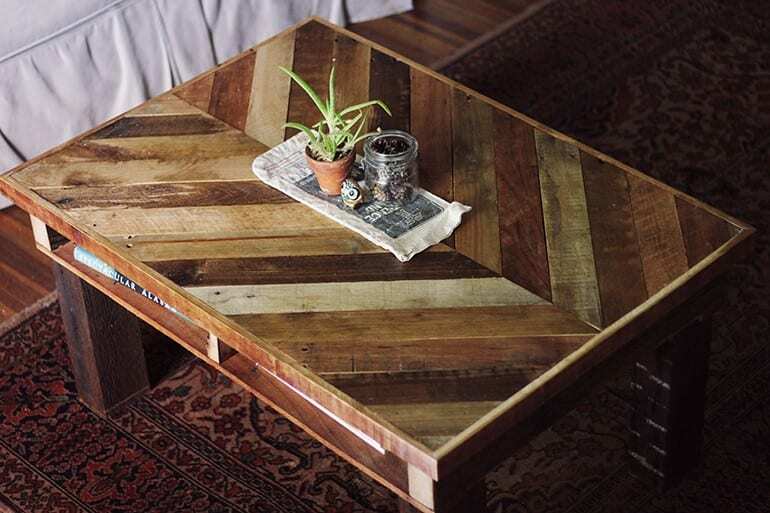 This DIY Pallet End Table Tutorial starts out by showing a partner wood lounge chair. 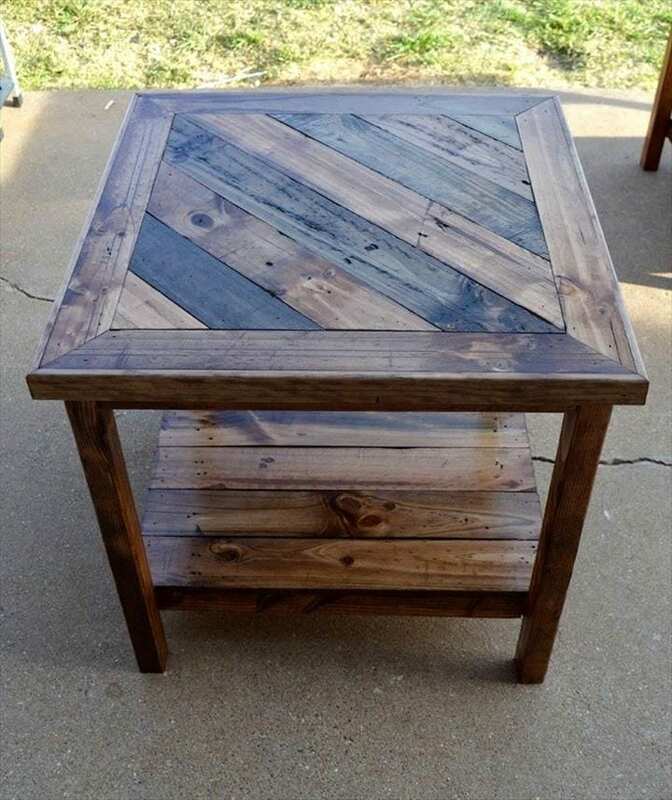 Although the video shows step-by-step on how to build this pallet end table, she does not mention what wooden pallet she used. I am guessing that she used a four-way perimeter based close boarded wooden pallet based on the width of the planks. But you can use a regular two-way entry reversible and dismantle it with a crowbar. 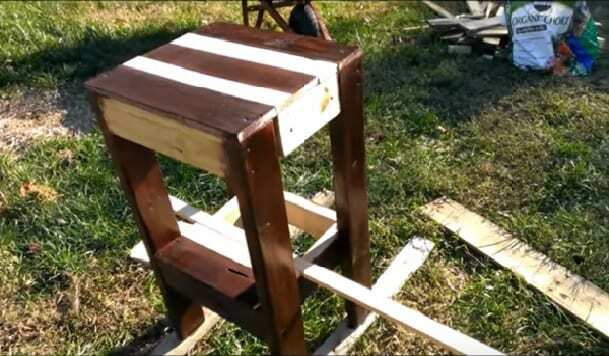 This DIY Video hosted by Sterling Davis shows us how to build an end table and bench from wooden pallets. Now, this requires a bit more skills than just your basic woodworking skills and may be a good project to level up your skills with a friend. One thing that does not change though, is that this project will help you cut costs and save on expensive wooden furniture by building your own from wooden pallets that you can probably get for free. If you’re doubting how and where to get free wooden pallets, you can check the website link below for more tips on getting wooden pallets for free. This DIY Tutorial on how to build end tables with wooden pallets is much easier than the others on our list. The video lasts only three minutes and forty seconds and does not require a lot of tools. For one, unlike the first YouTube video on our list, this tutorial did not require a high-end planer or a lot of sanding and fancy wood finishing. 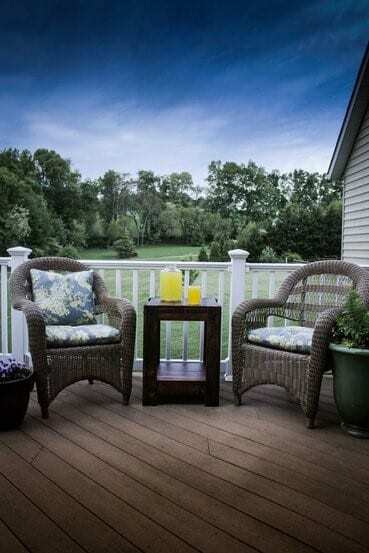 The process goes from dismantling your wooden pallets to rebuilding them by hammering down planks according to your desired style and dimensions. Finished with wood paint, this cheap and easy DIY is one of my favorites! This end table DIY tutorial from pallets has some pretty good external links as well so make sure to check out the original video. This rustic looking end table might look like a totally high-end wood but actually is just made from shipping wooden pallets. This end table plan is also one of the easiest on our list. This DIY can be done by someone with basic woodworking skills and minimal tools in just under 7 hours. This twelve-minute video is a detailed step-by-step tutorial of this pallet end table plan. It might look a little wobbly, but you can easily fix that by adding skirts to the legs of the table. 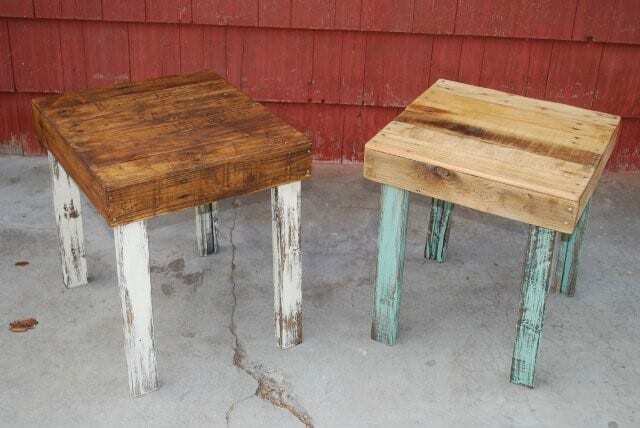 DIY Wooden Pallet End Table Plan that also looks like a stool or a home décor. This last on our list does all three. This end table is one of our cheapest yet on the list. If you manage to find a wooden pallet for free or bargain one for very little money you are already winning most of this project. From dismantling your wooden pallet with a crowbar to cutting it with a hand saw, to finishing it by hammering the planks together and adding a bit of wood glue, this project finishes with just sanding and a quick coat of wood finish. Amazingly, though cheap and doesn’t have many processes to it, this one can work in three wonderful ways. So, make sure to check out this video and start planning your next DIY wooden pallet project! Wooden Pallet DIY’s can sometimes cost a little money but definitely not more than your typical furniture! But this list I curated for you today gives you the best DIY wooden pallet end table plans that cost little to none at all. Make sure to check them out and tell me which ones you liked the most. And share the article to your co-DIYers and those needing a new end table. Woodworking doesn’t have to be so hard, all you need is a plan. See you next time!